Aemilian Rosengart was born the year after Mozart in South Germany. He does not seem to have received a specifically musical education, but his school in Ulm - run by Augustinians - must have given him a good grounding given that he ended up writing a substantial body of music. Rosengart took his vows at the Monastery of Ochsenhausen in 1775 and though he was based at a variety of other monasteries, Ochsenhausen remained the centre of his activities. From 1784 he was professor of theology and philosophy there. In 1795 he became director of music and in 1803 deputy prior. Some ninety of his compositions have survived and more than half of these are hymns. These hymns were settings of well known texts so instead of the communal singing of many verses, the hymns have been truncated to just 1 verse and doxology, generally sung by a soloist. These together with Rosengart’s Magnificats and Psalm settings represent a body of work written for Vespers, which was the service when composers were able to experiment a little. Rosengart writes generally for four-voice chorus or just soloists, plus organ, strings and the occasional wind instrument, often two flutes and two horns. His music is short-breathed but attractively melodic with a distinctive cast. Having listened to the disc, you can recognise his signature in the shape of many of the melodies. Rosengart must have had a group of good musicians at his service as this is not necessarily simple music. There is something of early Mozart in his style, but equally you can detect the galant style of Johann Christian Bach. As we know little of Rosengart’s training, it is difficult to assess which composers he was exposed to during his formative years. The pieces recorded on this disc are all rather short. The longest is the Te Deum, but only two others are longer than five minutes. All are attractive and some are extremely vivid. This vividness arises, in part, because some of the solo numbers are taken from Rosengart’s operas and oratorios. These arias, with new sacred words, are the only surviving remnants of Rosengart’s operatic and oratorio output; none of his major works seems to survive. On this new disc all but the Te Deum are world premiere recordings. 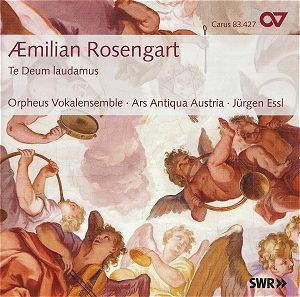 The Orpheus Vokalensemble, whose previous disc on Carus enterprisingly interleaved Schumann choruses with specially composed modern pieces, are joined on this disc by Ars Antiqua Austria and directed from the organ by Jurgen Essl. The disc was made at Rosengart’s church, Klosterkirche St. Georg, Ochsenhausen. The recording has attempted to reconstruct as closely as possible the performing conditions of Rosengart’s day. The numbers of instrumentalists are those specified in the surviving parts and both singers and instruments performed from the gallery, gathered around the organ. This had the effect of giving a fine acoustic blend between performers and organ, meaning that the performances could be easily directed from the organ and giving rise, certainly, to a very attractive sound. These are attractive, charming works given in confident, musical performances. The soloists are taken from the choir - which is made up of professional singers. Apart from the odd piece of smudged coloratura the solo performances are all lively and creditable. This is not an overly taxing disc, but these charming pieces given in winning performances provide an interesting picture of monastic music-making in South-Western Germany.